First you should locate the Voltmodding spots on your board. For all three mods, you need a soldering iron, solder tin and flux. If this is the first time you are soldering something, you should practice a bit before starting on your motherboard. That's the most important VMod, because the board can not give more than 2,9V to the memory. But as overclocker, for example, with BH-5 or OCZ EB you need a higher Voltage. 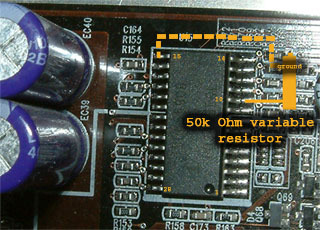 Solder a 50k Ohm variable resistor, set to 50k, between pins five and eight. Measure VDimm with a multimeter on the read point. 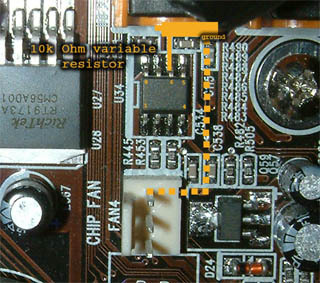 Lower the resistance for more voltage. I do not recommend going over 3.2V, because the A64's memory controller does not like too much voltage, and could die. For those who need a CPU voltage of more than 1.7V- But you need good cooling. 1.8V should be possible with watercooling and 1.95V with a phase change unit. Solder a 50k resistor, set to 50k ohm, between pin ten and ground. Pin fiveteen is ground, but you can also use another ground location on the motherboard. Lower the resistance for higher voltage, watch VCore readings in bios. With more chipset voltage it should be possible to run a higher HTT without lowering the LDT. Solder a 10K resistor, set to 10k ohm, between pin six and ground. I prefer to use the fan connector for ground, because it's near pin six's location. 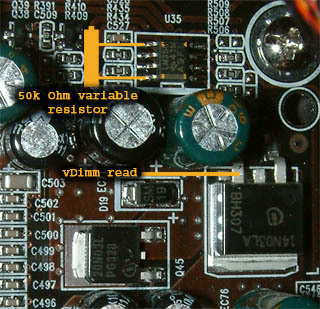 Lower the resistance for more voltage, watch chipset voltage readings in bios. Don't go beyond 2.1V, it might kill your board. All Vmods at your own risk. Good Luck and keep it extreme.